I am thrilled to be sharing this huge Counting and Cardinality Unit with you! This is the math unit we start the year with in kindergarten (be sure to see my FREE kindergarten curriculum map in the Exclusive Freebie Library! )The kids love all of the hands-on activities we get to do, and I love how easy it is to keep them engaged. 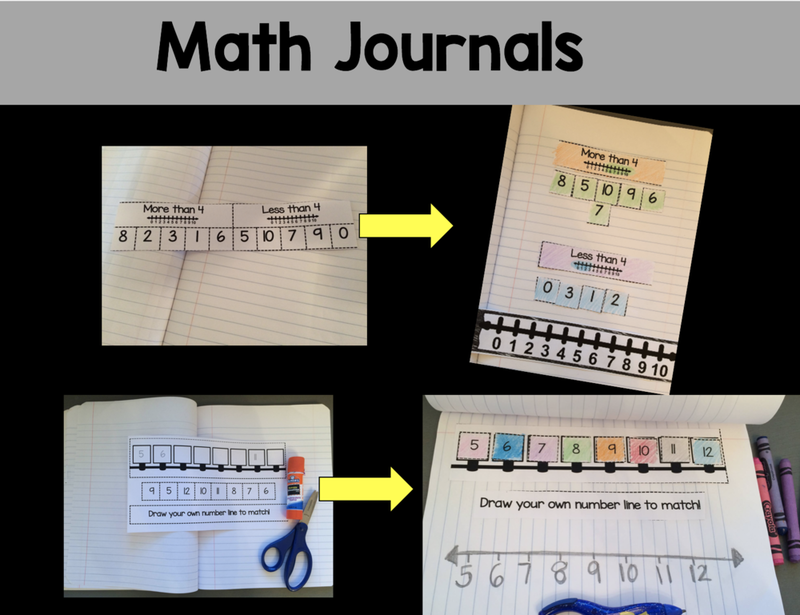 Try a few FREEBIES from this math unit! I hope you enjoy them as much as we do. Right now, we are tackling COUNTING & CARDINALITY. I actually teach it a little differently than some teachers. I focus on numbers 0-10 in the fall and then come back in late January to teach the teen numbers through 20.This unit is set up so you can do this, or if you prefer to tackle 0-20 all at once it is up to you! Included in this bundle are standards checklists, pre/post tests, worksheets, math journals, centers and activities and MORE! I love this because it keeps my papers nice and smooth, and it is so easy to flip through and see what I have to grab exactly what I need.I start each unit by sending home standard checklists to parents so they know what their student will be learning. I also keep a color version in my Counting & Cardinality Unit binder as an easy visual reminder for me as I am writing my weekly lesson plans. I include this exact same checklist (with just a slightly different header) to send home after the unit is complete so parents know the standards their child mastered, and what they still need to work on.This way parents stay involved and aware with what we are doing in math. 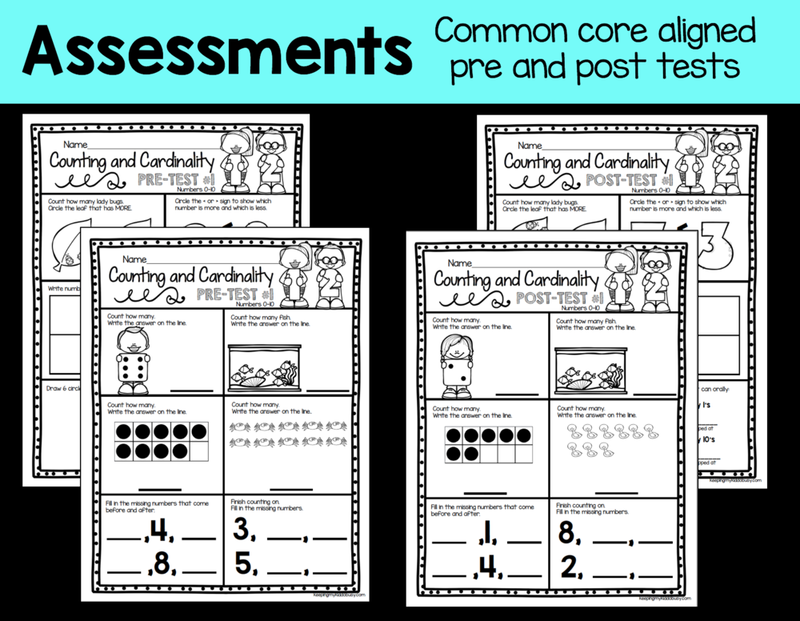 You can even make a copy of the child's pre/post test that correlate with the standards checklists. This way there are no surprises at report card time and I love writing little notes about every child's improvement - big or small! This is a peek at what I use for pre/post tests for this unit. The tests are pretty much exactly the same, but the numbers, pictures, etc. are different. This will give you accurate data for growth.We are mandated to give pre and post tests for our math units so we can chart progress. These tests cover all the standards in the unit and two versions are also included if you choose to "split" the unit and do numbers 1-10 separately. Both version are included for your convenience. I start with 1:1 correspondence and numbers 0-10. I always have students put their counting bears (or whatever objects they're using) and put them in a line - or else they have their bears in a big pile and forget which ones they have counted and end up confused. Having objects in a linear fashion also helps with left to right progression.I've it broken the worksheets down into numbers 1-3 to start and then 4-6, 7-9, etc. These worksheets are a perfect reinforcement of what we are practicing during our lessons. To start, I have students point to 1 object and say one number. Then they pick up their "magic counting finger" and point to the next object and say the next number. I also include worksheets that address all the other standards in this unit.Practice showing numerals on ten frames and number lines. We start with K.CC.C.6 - telling whether the number of objectsis more than/less than.The gum ball, flower baskets and lady bug worksheets simply have student count the objects and color which one has more. The number line at the bottom helps them see which quantity is larger, or more. Once we do these three worksheets, we can move on to having them count the objects and then write the number below in the box. The bumble bee, butterfly and apple tree worksheets have students do this extra step of writing the number in the boxes. Again, the number line at the bottom helps them see which quantity is larger, or more. One more, one less is also a tricky concept for students to master. I first teach the more then/less than concept (shown above) using those worksheets and centers/activities (I outline those later in this post). Once they really grasp the terms more and less, I can move on to this standard of one more, one less. By now my students are familiar with number lines (for the most part) and how to use them a a reference tool. There are cut and paste as well as fill in the blank worksheets. I scaffold the more than/less than worksheets for my students. This is a trickier concept for them to understand! Next, we move on to counting on, or K.CC.A.2 Count forward beginning from a given number within the known sequence (instead of having to begin at 1).Sometimes we do these as partners, and I break these worksheets into numbers 0-10 and teen numbers. We do a lot of fun skip counting activities in class, and these worksheets are great reinforcement. Counting by 5s is not a kindergarten CCSS standard, but it is included to use if you wish. 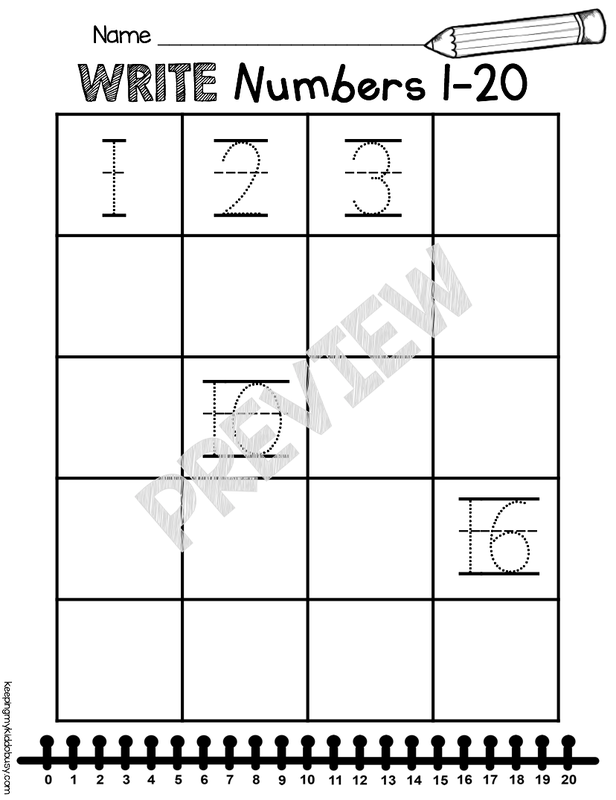 Lastly, the worksheets cover writing numbers 1-20. I scaffold this with a few different options, but this is also a great check to see where your kids are at. I don't generally just use worksheets as a lesson; however they are wonderful to use as reinforcement after an activity, for small groups, homework, etc. 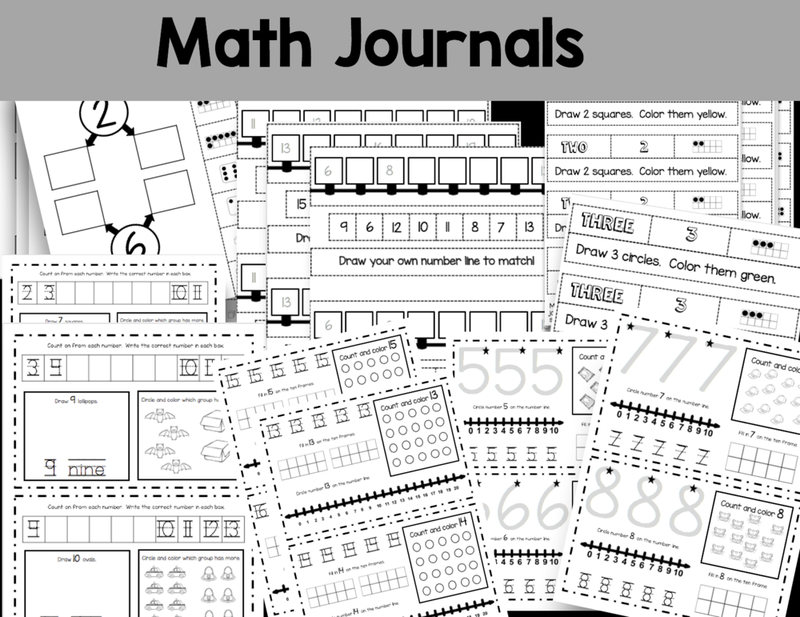 Do you use interactive math journals? It is a lot of work to set up and train your students in what you expect and to get going, but then they are awesome!This bundle comes with tons of journal prompts and activities for the entire unit.If you prefer not to use journals, these printables can also just be used as self-starters, exit slips or worksheets. How fun are these centers for students to practice the standards in a fun, hands-on way?! Most use materials you already have in your classroom - locking cubes, color poms or beads, clay or play dough, dry erase markers, dice, etc. So many fun activities and games for you students to practice the counting and cardinality standards. These also work great for morning work tubs or small groups. We play some of the game with our "big kid" buddies and the kids have a blast while practicing the standards. There are over 180 pages or worksheets, journals, tests, checklists and centers in this unit! All the work is done for you! I have math units available for all the Kindergarten Common Core domains!